The lack of timely, comprehensive and relevant information on aggressive tax planning strategies is one of the main challenges faced by tax authorities worldwide. Mandatory disclosure regimes can enable countries to quickly respond to tax risks by providing early access to such information. 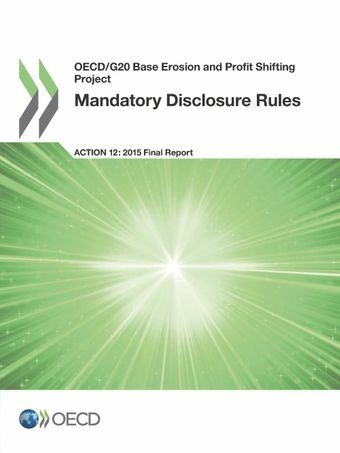 This report includes an overview of mandatory disclosure regimes, based on the experiences of countries that have such regimes, and sets out recommendations for a modular framework for use by countries wishing to implement or amend mandatory disclosure rules in order to obtain early information on aggressive or abusive tax planning schemes and their users. The recommendations provide the necessary flexibility to balance a country’s need for better, more timely information with the compliance burdens for taxpayers. This report also sets out specific recommendations for rules targeting international tax schemes, as well as for the development and implementation of more effective information exchange and co-operation between tax administrations.